Like any other website/ blog, creating fitness websites is really easy with WordPress. There are thousands of awesome free WordPress themes on the web – actually for any type of website. 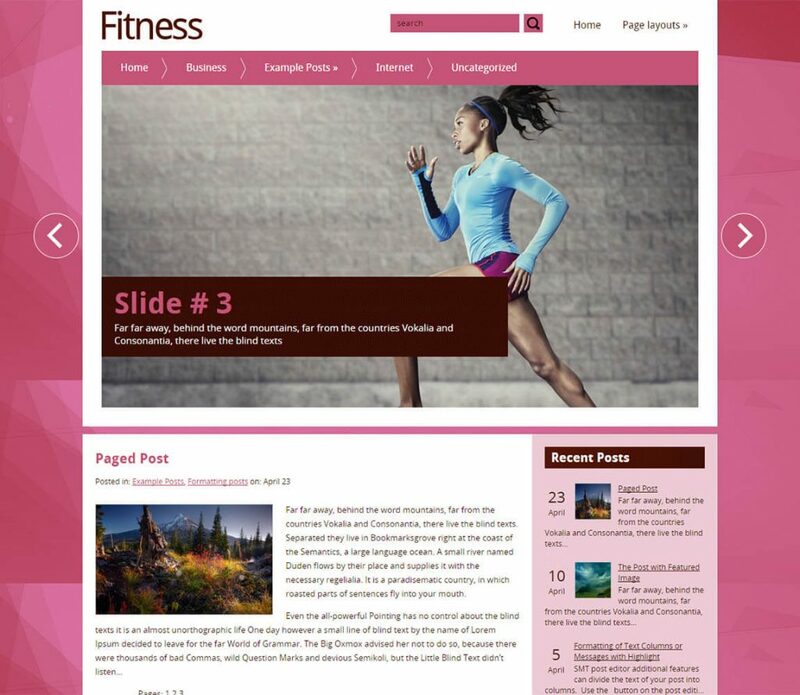 So if you are planning to create a new website for your fitness club or gym or fitness instructor, using free fitness WordPress themes may be a fine solution. Wondering why free WP fitness can be fine solutions? First of all, you get them for FREE! If you have a limited budget for your new website, they are surely awesome. Secondly, using a ready-made WordPress template is a benefit as it provides an overall skin to your website (how it looks). You can easily add your custom content, customize and get your own website ready instantly. Moreover, WordPress themes are beginner-friendly. You can easily create a website even if you are just a fitness expert/ fitness business owner with no coding knowledge. Free WordPress themes provide a modern responsive design. You do not need to hire a web developer/ expert to make your website cutting-edge design and features. Since there are thousands of themes for WordPress, users often get confused while choosing an appropriate theme. Therefore, we have created some blog posts featuring the best free themes for various niches/ website types. And this post is another one featuring best free fitness WordPress themes. You can use any one theme from the list below and create an awesome fitness website. 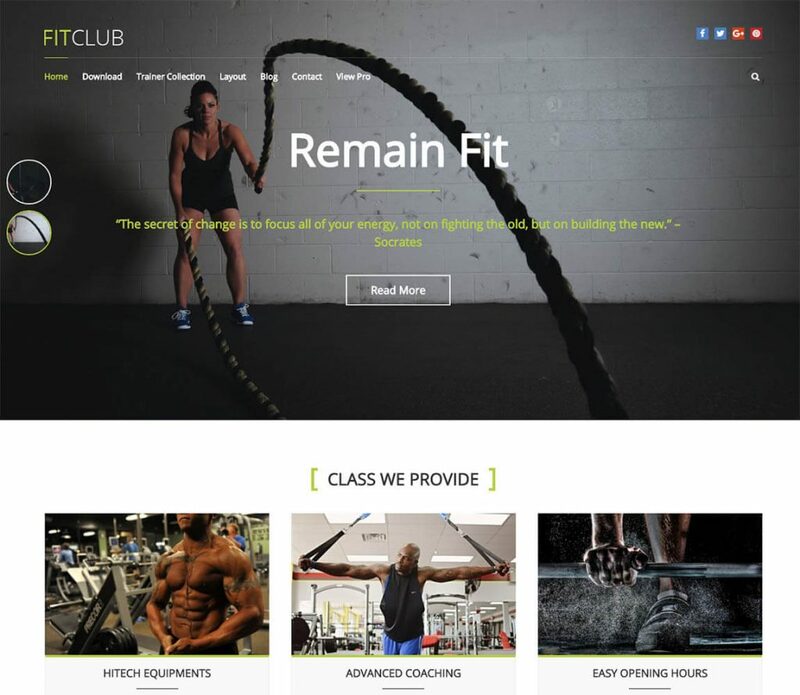 Fitclub is a free responsive fitness gym style WordPress theme. It provides a beautifully designed Fitclub template and custom widgets with which you can create a professional fitness website. Similarly, this theme includes bunch of social icons options that can be easily be integrated on the top header bar. These icons will help you to connect with your social profiles.Fitclub basically focuses on generating fitness, gym type of websites. However, it can be used to create any type of sites because of its pliability and tranquility. Download the theme free and build an awesome website. A multipurpose theme suitable for almost any website, Zakra is is one of the most modern looking WordPress themes. It features a demo starter website specifically designed for yoga as Zakra Yoga demo. This demo has all the features you would ever want in a yoga website. Similarly, with just a few tweaks, you can easily have a well functioning fitness website for any fitness platform. It has separate pages for packages, home, lessons, news, about and contact. You can easily customize them according to your website and get a well-functioning website. 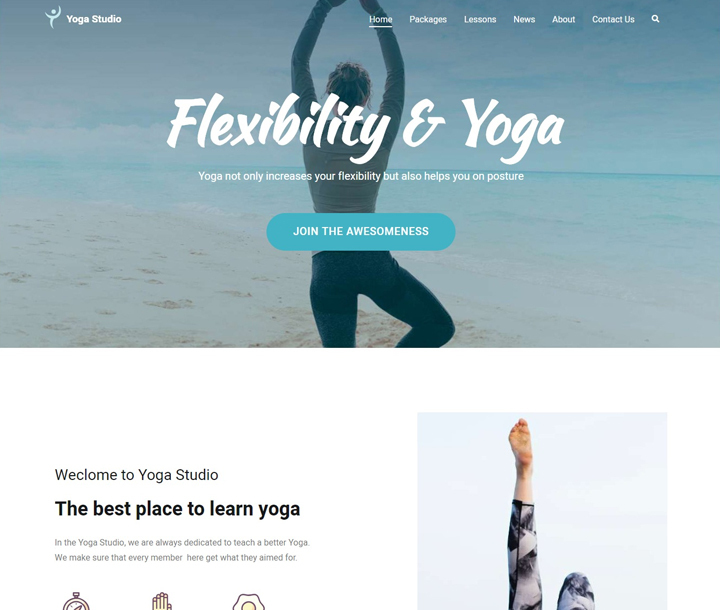 Pranayama Yoga is a free WordPress fitness theme that is designed especially with yoga and meditation in mind. Perfect for fitness centers, meditation centers, health clubs and more, this template is completely responsive. The design is soothing and beautiful in itself, giving a clean and professional aesthetic. Easy to use, it is also built with SEO in mind. Additionally, it even has options for custom CSS. This ensures that the theme is developer friendly and you can easily add or remove any codes to match your requirements. With social media integration, attractive CTA’s and appealing icons, this free WordPress fitness theme is surely the ideal choice. Responsive, mobile-friendly and retina-ready design. Translation ready and WPML compatible. 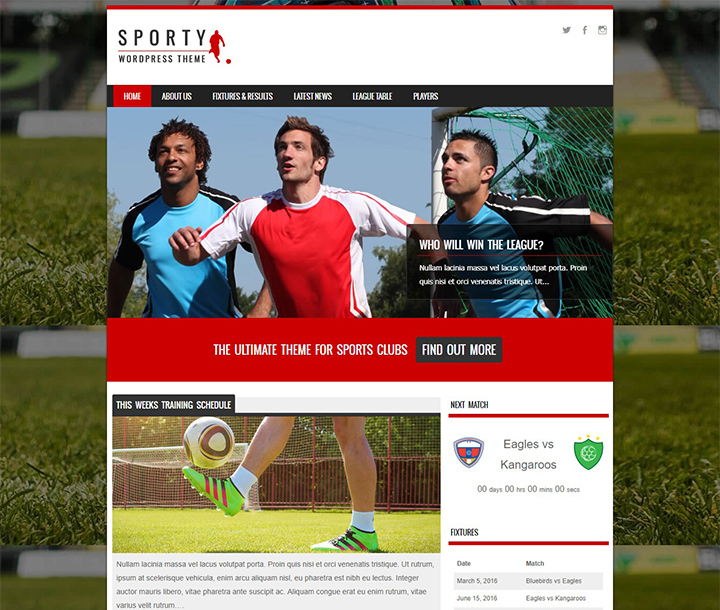 As the name would suggest, Sporty is a free WordPress theme that is ideal for sports or Fitness niche. Whether you deal with the niche or want to start a website related to it, this theme is the perfect head-start. The design is simply amazing visually and is sure to leave a lasting impression on anyone who lands on the site. As it is completely responsive and retina-ready, everything you add on the site looks absolutely flawless. It even seamlessly integrated with the SportsPress Plugin which gives you additional features to create the perfect online platform. Other advanced features include various player profiles, league tables and fixtures, color and layout options. 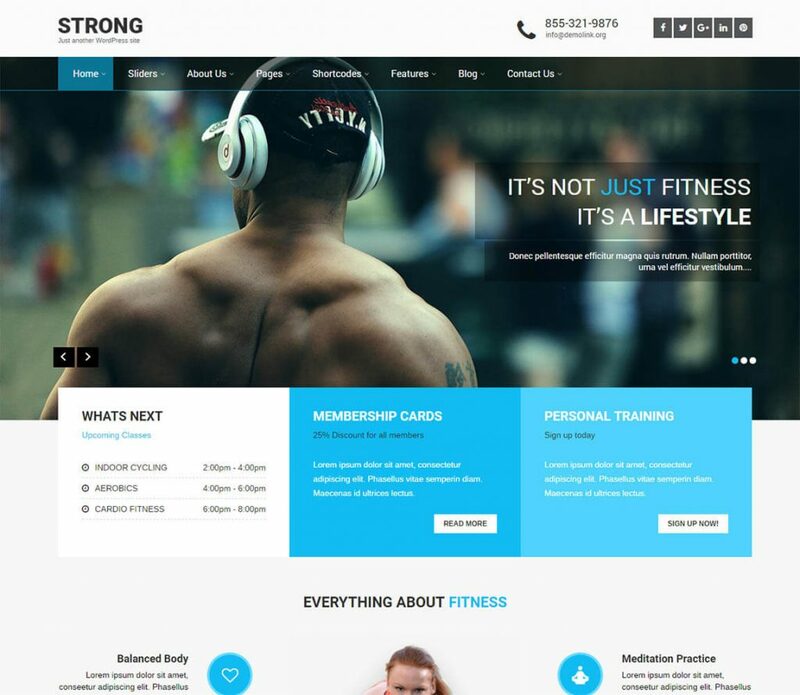 SKT Strong WordPress theme is suitable for modern gym, fitness, personal trainer, studio, Yoga, boxing, aerobics, spa websites, and other multipurpose local business use. It has a stunning responsive design that looks great on any device. It is fully translation ready i.e. any hardcoded English text in the theme can be translated into your native language with ease. Google font default has been loaded while more font options in paid theme. This theme also pursues up-to-the-minute design with easily changeable logo, codification, tagline, and favicon. Wellness is a well-designed, well-coded modern WordPress theme free for fitness and wellness websites. You can create a worldly online journal for health, fitness, and well-being using this theme. It is based upon WP customizer so you can update and view changes in real time. It comes with 6 built-in widgets i.e. About, Classes & training listings, Recent posts, Services listings, Social icons and Client Testimonial. The theme is hand-coded according to current WordPress standards, which help your ranking in search engines like Google, Yahoo etc. 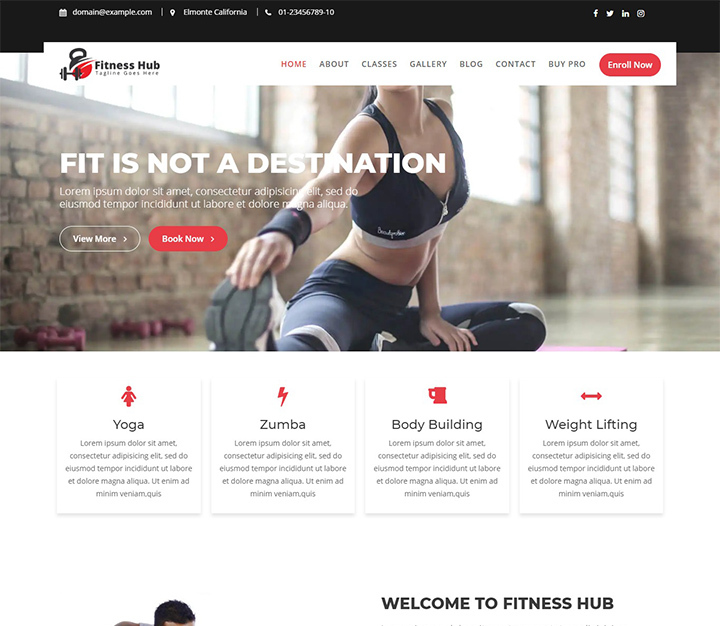 A highly responsive, retina-ready and stunningly professional looking theme, Fitness Hub as the name suggests is an incredible WordPress fitness theme. The standard layout design in itself stands out from the crowd. And with the ease of usage with tons of useful features, this theme is surely one to try out. It is completely responsive and retina-ready. Get Advanced custom widgets that you can add and remove as per your requirements. Additionally, you also get Unlimited Pages on Section so that whatever you wish to display is up-front for your users to see. Another great thing about this free theme is that it is also cross-browser compatible. 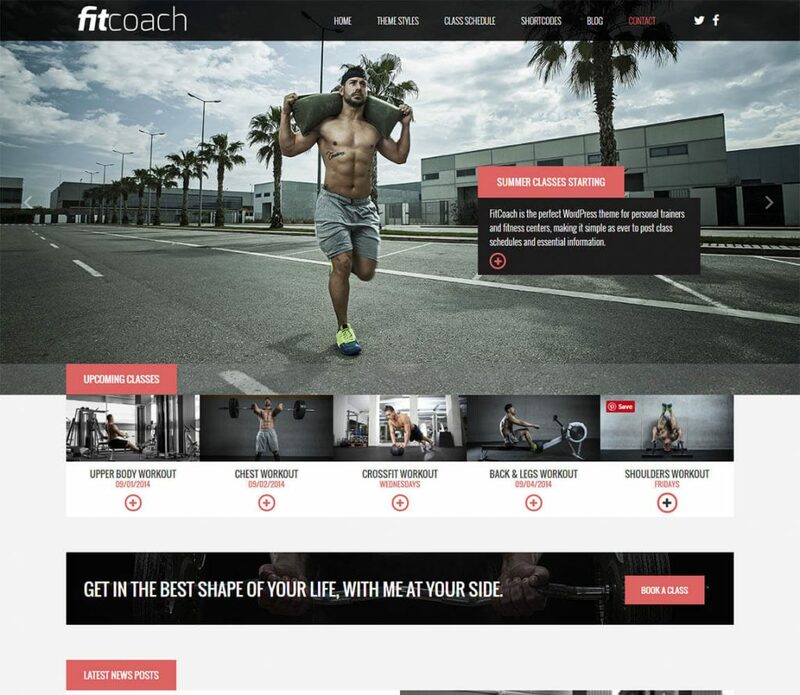 Fit Coach is a free WordPress fitness theme that is fit for creating professional fitness business or portfolio websites. 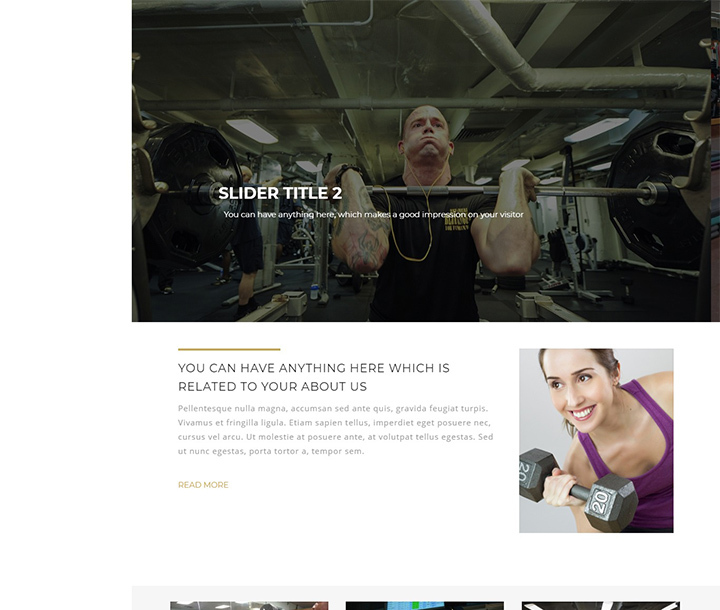 It is the perfect WordPress theme for personal trainers and fitness centers, gyms etc. This theme possesses both standard and unique templates as seen in the demo. Also, it features Google Fonts Selector with a complete selection of fonts from the Google library. It can be demonstrated on the screens of mobile devices, with crystal clear particularity. This is due to the fact that fit coach is fully responsive and mobile friendly. Download the theme FREE today! 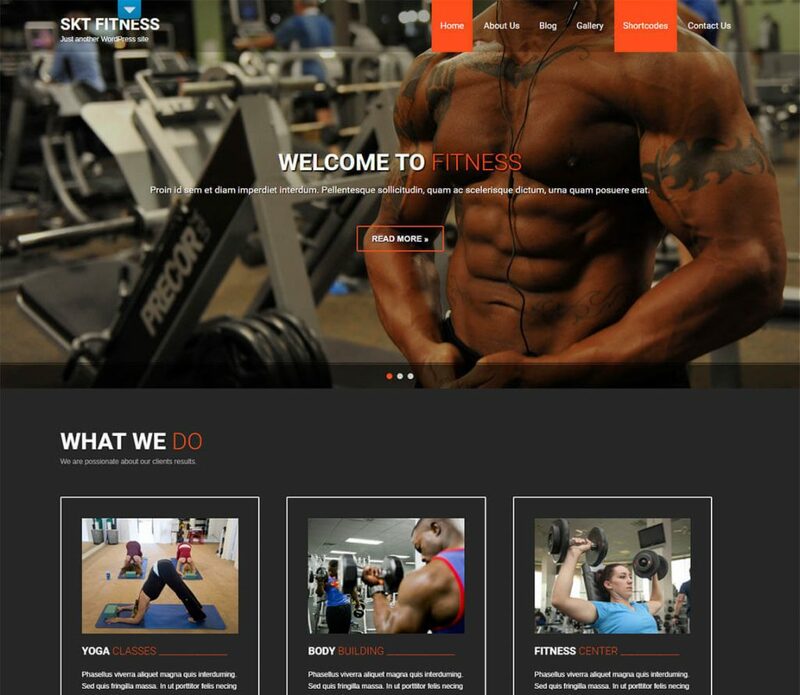 SKT Fitness Lite is yet another free WordPress fitness theme from SKT Themes. It is a fully responsive and mobile friendly theme that adapts perfectly to any device. The theme is based on latest WordPress technology ‘Customizer API’ which enables you to customize and preview the changes in real-time. It is a wonderful theme with plenty of customization options and easy to use features. Additionally, you can use a large number of WordPress plugins to add various functionalities needed in your website. In the nutshell, it is perfect for a modern fitness website. 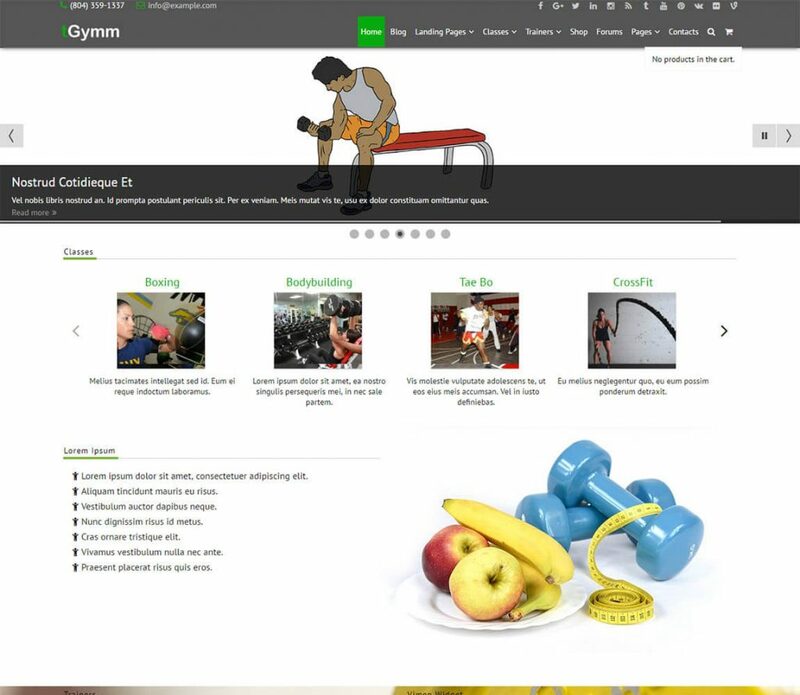 fGymm is a free responsive WordPress theme for gym and fitness websites. It is an ideal choice for creating websites for health and fitness clubs, CrossFit programs, fitness professionals and personal trainers. The theme is fully responsive and mobile ready that looks great on any device, both large screens, and small screens. It features built-in homepage sliders, multi-level drop-down menu, social icons in header and footer, sidebars, footer widget areas etc. With its flexible and highly customizable design, you can create an alluring website instantly. Fitness experts often suggest people participate in various sports and games in order to stay healthy and fit. So if you are a fitness blogger, sports coach, trainer, sportsperson, you need a good-looking website/ blog of your own. Fortunately, there are plenty of WordPress themes that make this task really easy. 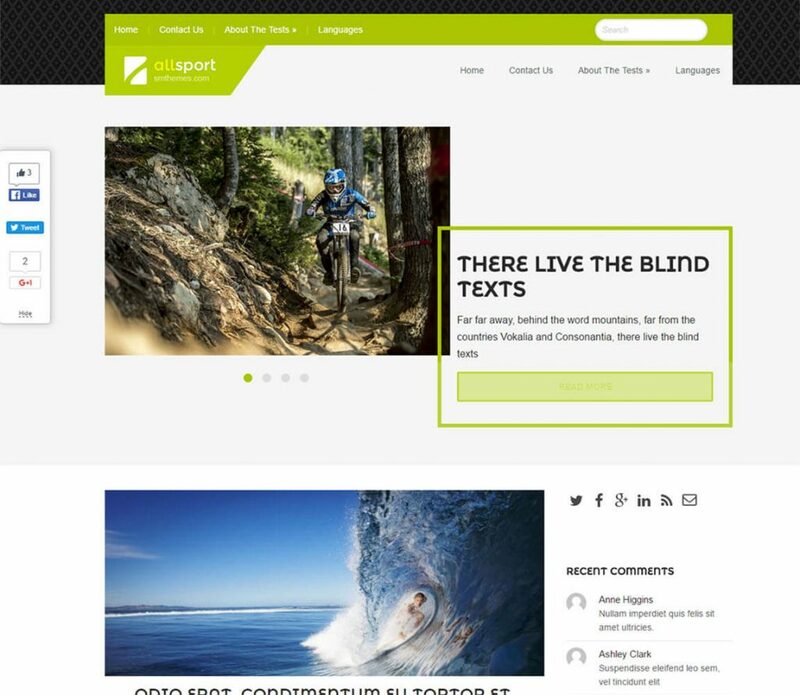 Among all, AllSport is a really nice and powerful free WordPress template. It is multifunctional and can be used for different types of websites. It can be easily translated into any native language with magnification plugins. Yet another amazing options for those who are looking for a free WordPress fitness theme is The West. The layout is responsive, retina-ready, mobile friendly and visually attractive to say the least. It is perfect for sports, fitness, gym and health based websites and clubs related to the niche. As it is cross-browser compatible it effortlessly loads on all browsers with ease. Another great thing about this theme is that it is translatable which means that you can change it any of native language with ease. The design is also SEO optimized so that your site always ranks higher on all SERPs. Get everything to set up a professional site and that too for FREE! SEO and SMO optimized theme design. I have carefully handpicked the themes in the list so as to provide you a quick and quality solution to your need. If you are already using any of the themes above, feel free to write your comments below. We surely appreciate any feedbacks from our users. And if you found this list helpful, here are more of our handpicked list of best WordPress themes you can check out! 15 Best Free & Premium WordPress Themes for Artists 2019! 20+ Best Gutenberg Compatible WordPress Themes! 20 Best Insurance WordPress Themes For Business Agencies! Hi Sunita! Thanks for this great list. Let me ask you a question: I want to build a health business directory where gyms and personal trainers would advertise their brands in my website to get more clients. Do you have any suggestion of a wordpress theme that would manage the ads, payment process and so on; easily? I’m not a programmer, so the less coding it needs, the better for me. Thanks! You can use any of the above mentioned free WordPress themes but make sure that the theme has good support to WooCommerce. In addition, you should use a membership management plugin like WP-Members (https://wordpress.org/plugins/wp-members/) so that gyms and personal trainers can post and advertise. Firstly, you can try with FitClub FREE or any other free theme and if you like it you can also upgrade to its premium version. Insta Appointment Lite Theme is very nice theme. Thanks for sharing such a great collection of themes. Thank you for sharing these nice themes! Thank you so much Sunita for sharing these wp themes, currently i started a blog but i dion’t understand that which theme is best for me but this blog solve my problem.